Aye! So, today is the third day we are in Bali. Short story, me and Ralf decided to go to Ubud area today. So we drove from our villa around Seminyak to Ubud, it took about 45 minutes for 30 km. Roughly we arrived at 12 pm. But before we walk thru the Monkey Forest, we had lunch at Babi Guling Ibu Oka Restaurant around Ubud area. Anyway, the restaurant was not that aesthetic but big enough and about the menus were delicious and affordable prices, overall it was good. So, anyway, after we've finished our lunch. Next, we continued for the Monkey Forest trip! Aye! Oh, but we still need to drive from the Restaurant to the Forest about 3 km, is not that far. After arrived, we have to buy ticket. We bought 2 tickets for 2 adults and it costs 80.000 rupiah, it means 40.000 rupiah for each. And yes, we also got flyer which describes Monkey Forest, they have it in any languages which is good if you want to know more about Monkey Forest. And for 5th - last pictures, it was what's inside the Monkey Forest. Actually, Monkey Forest is more beautiful than the pictures that I've taken. 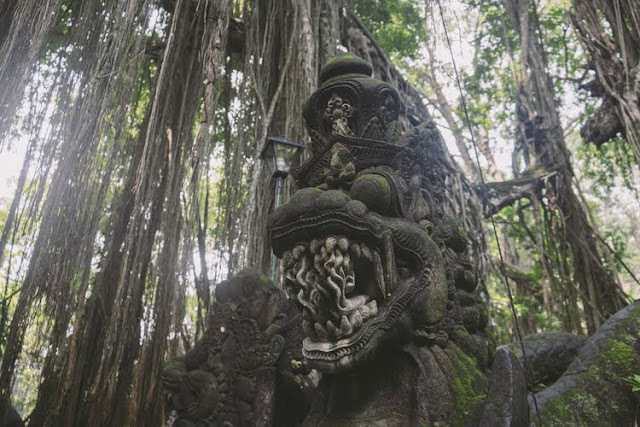 Any interesting things inside the Monkey Forest like Holy Water, Sacred Pool, the Temples, Art Gallery, the Shows too and etc. But I didn't take any pictures because mostly I enjoyed my time being there. So, that's all after we went home, we have dinner at Crocodile Restaurant in Seminyak. Oh anyway, if you go back home in the evening it's quite jam in Ubud area. #1 / Dresscode: Empty your pockets before you go. These little guys are smarter than you think. Their muscles are well developed and their thinking skills are geared towards thinking humans come here with food and interesting collectibles. If you have candy in your pocket, they will notice. They will use their instincts to get what they want. Don't bring candy or snacks! #2 / Gear: Monkeys love to pickpocket. That means your purse, backpack, camera case, and fanny pack are all places of potential places of unwanted attention. In the photo above you can clearly see how one clueless tourist was taken advantage of by this curious fellow who stole her bottle of water. We watched him (or her?) open the cap and try to drink the water by tipping the bottle over the step. My advice? Leave your backpack at home. 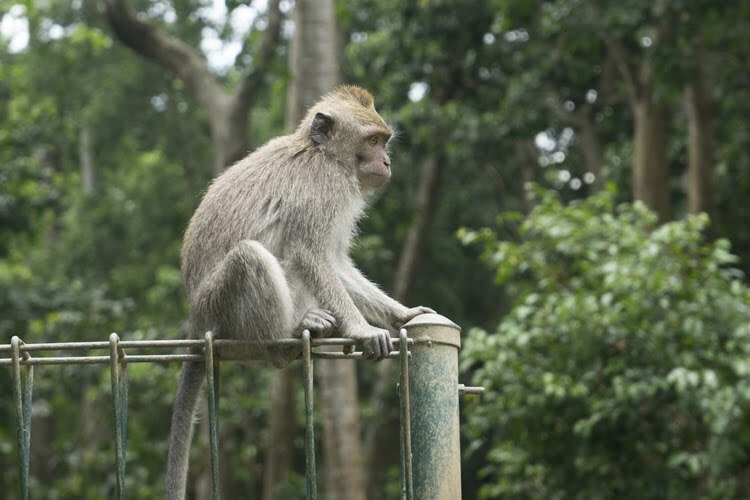 If a macaque tries to take something from you, let it to avoid an aggressive altercation. #3 / Photography: Keep a distance from the monkeys. Use zoom instead of getting up close and personal. Just like people, these little guys don't like to have a hundred camera lenses poking at their face all day. If you want to avoid getting bitten, keep your camera lens at a safe distance of at least 2-3 feet away. 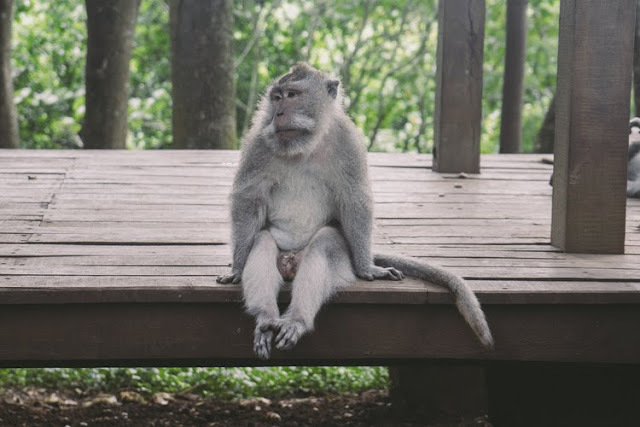 Balinese people both love and hate monkeys. The root of these feelings lay in the stories of Balinese Hinduism. Prolonged eye contact or slow movement can be perceived as threat. #5 / Stay on the path: This doesn't need much explanation I think. Like many wild animals, macaques are territorial creatures. In this forest alone there are over some 30 tribes. Try not to wear out your welcome. Have a nice day! 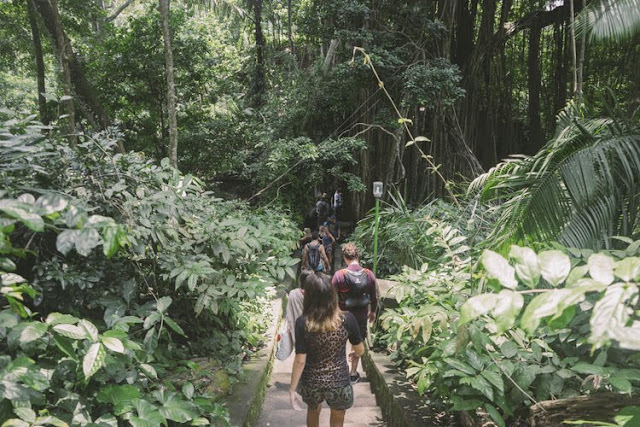 Kindly, share your story if you are about going to Monkey Forest or if you've been there! Thank you for reading my page. Much love. Ralf! who is on your shoulder? Haha!